Perceptions and realities filtered through our own prejudice. Yes… often limit ourselves without even realizing it. 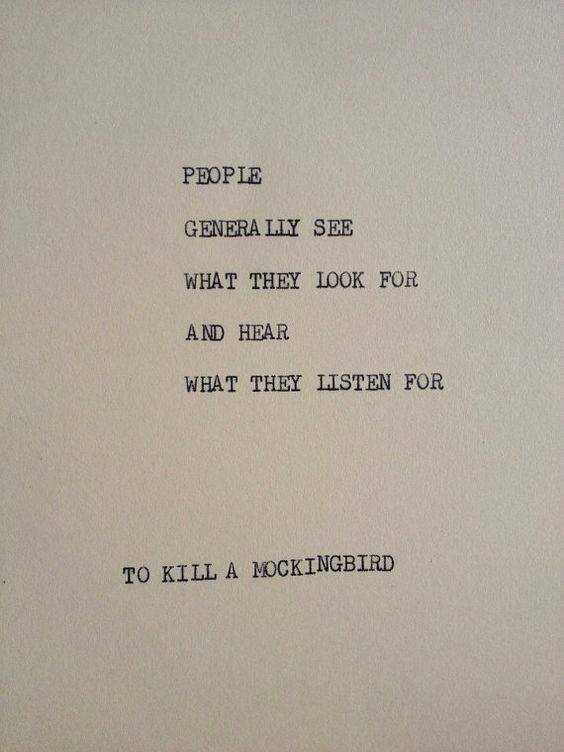 Atticus Finch in to Kill a Mockingbird is my favorite character in a book/movie. He is a model of manhood at its best (and it was written by a woman.) Gregory Peck said it was his favorite role, and if I remember correctly, said he’d like “Atticus Finch” on his tombstone. I hope it is. I just looked. Sadly, “Atticus Finch” isn’t written on his tombstone, but I was delighted to read that his eulogy was read by Brock Peters, whose character, Tom Robinson, was defended by Peck’s Atticus Finch in To Kill a Mockingbird. I remember where this quotation is in the book, I think. I sure love Atticus and his children. Great one for today’s society. My friend at work, Terry, has a granddaughter and I drew and painted her baby name of “Harper.” Neither mommy or grandma knew Harper is a girl’s name or that Harper Lee was using it as a “pen name.” They just liked the sound of it. 🙂 I bought the baby the book (future reader)! It makes communication almost impossible. This is problem number One in the information theory.